April 21 - No Tournament. April 28 - Westfield G/60 Octos 12:15 p.m.
Ratings from the May Golden Database will be used. May 5 - Westfield G/45 Quads 12:15 p.m.
May 12 - Westfield $5 Quads 12:15 p.m.
May 19 - Westfield G/50 Quads 12:15 p.m.
charged $5 less! Rounds: 12:15, 2:10, 4:05 p.m. Info: westfieldchessclub@gmail.com. Ratings from the June Golden Database will be used. May 26 - No Tournament. June 2 - Westfield G/60 Quads 12:15 p.m.
charged $5 less! Rounds: 12:15, 2:30, 4:45 p.m. Info: westfieldchessclub@gmail.com. June 9 - Westfield G/45 Quads 12:15 p.m.
members. Prizes: $60 to first in each section. Registration: 11:20 a.m.-12:10 p.m.
Those registering before 11:50, or lined-up to do so, will be charged $5 less! 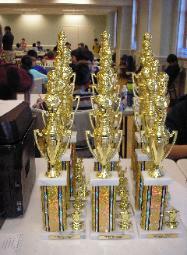 June 16 - Westfield G/50 Quads 12:15 p.m.
our previous Grand Prix events. Westfield Y, 220 Clark St., Westfield, NJ 07090. 3 Sections: Open, U1800, U1200. EF $45, $35 members, GM free (-$30 from prize). Prize Fund: $900 b/30 paid section entries. 70% guaranteed. Prizes: $240-200-160. U2400 $120, U2200 $100, U2000 $80. Prizes, b/14: $80-60, U1600 $50, U1400 $40. Prizes, b/14: $80-60, U1000 $50, U800 $40. Register: 11:00 - 11:50 a.m.
Those registering before 11:30, or lined-up to do so, will be charged $5 less! Rounds: 12 noon, 1:45, 3:30, 5:15 p.m.
June 30 - Westfield G/60 Quads 12:15 p.m.
members. Prizes: $60 to first in each section. Registration: 11:30 a.m.-12:10 p.m.
Rounds: 12:15, 2:30, 4:45 p.m. Info: westfieldchessclub@gmail.com. Ratings from the July Golden Database will be used. July 7 - Westfield G/45 Quads 12:15 p.m.
July 14 - Westfield Summer Scholastic 12:15 p.m. Sections: Open, U1250, U750. Open: 3-SS. G/40 d5. Rounds: 12:15, 2:00, 3:45 p.m.
lined-up to do so, will be charged $5 less! Info: westfieldchessclub@gmail.com. If possible, we will start rounds 2-4 in the U750 & U1250 earlier than advertised. July 14 - Westfield G/75 12:15 p.m.
2 round quads. G/70 d5. Westfield Y, 220 Clark St., Westfield, NJ 07090. EF: $5. 1-3, 4-2 then 2-1, 3-4. Info: westfieldchessclub@gmail.com. Participation limited to adults (any rating) & under age 18 with a rating of 1750+. July 21 - Westfield G/50 Octos 12:15 p.m.
p.m. Those registering before 11:50, or lined-up to do so, will be charged $5 less! Rounds: 12:15, 2:10, 4:05 p.m. Info: westfieldchessclub@gmail.com. Ratings from the August Golden Database will be used. July 28 - Westfield G/60 Quads 12:15 p.m.
August 4 - Westfield G/45 Quads 12:15 p.m.
August 11 - Westfield G/50 Quads 12:15 p.m.